Beats, the new music streaming service, might actually win you over. 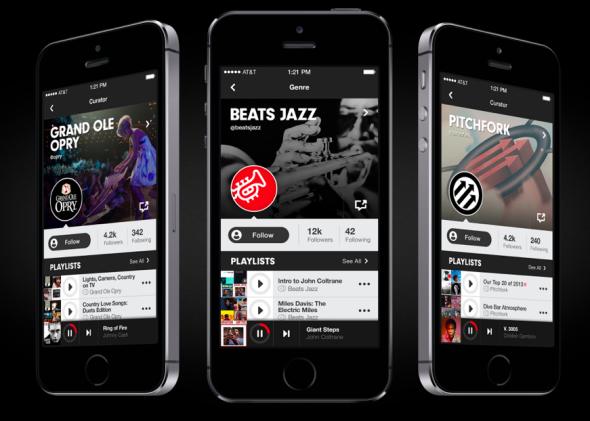 Beats is using highly customized music recommendations to take on streaming services like Spotify and Rdio. It’s hard to get a music streaming service right. It has to have a big library, the right social media tie-ins, and solid mobile integration. Services like Spotify and Rdio have been holding down the fort in the United States, but newcomer Beats is hoping to shake things up. And it actually seems promising. Beats Music is hoping that it can provide insightful curation and recommendations that appeal to users emotionally. Would-be listeners answer a series of questions when they join the service, providing expected information like age and gender to determine what types of music you may have listened to at different points in your life. But the Beats algorithms don’t stop culling data there. They monitor what users listen to, where, and at what volume to figure out patterns. If a user always listens to upbeat pop at the gym but never anywhere else, Beats will take note and won’t blast Ke$ha at bedtime. Competitor services try lots of things to connect users with new music, including allowing them to see what Facebook friends are listening to, or facilitating collaborative playlists for recommendations. But Beats seems to be making the most concerted effort to delve into every user’s psyche and draw out clues to what they don’t yet know they like. That sort of constant interrogation hints that, in its overzealous attempt to build the greatest music streaming service on earth, Beats has forgotten one of the most beautiful things about music on the go: the ability to play it with a swipe or two and then get on with life. The biggest problem with Beats right now seems to be that it only has a seven-day free trial (compared with Spotify, for example, which has unlimited free service with advertising). Seven days might not be enough time to decide if Beats is worth shelling out $9.99 per month, but if you’re fed up with the current options it could be worth trying. At the very least it will make you feel like your musical tastes sit at the center of the universe.